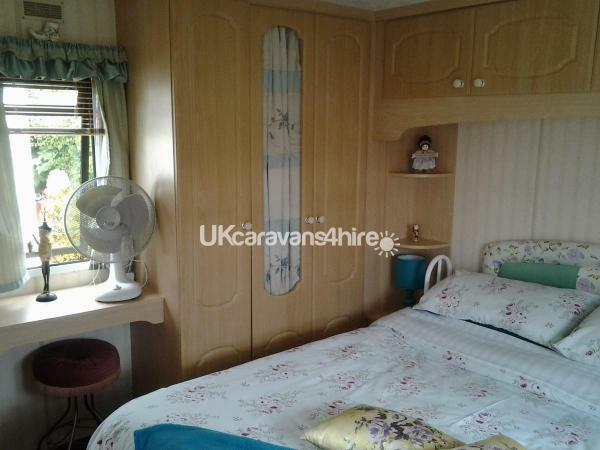 Additional Info: The shower cubicle is also a small hip bath ideal for bathing children, the bathroom is quite big for a caravan. the veranda has a gate both ends, we have a slow cooker, the fridge has a small freezer box.we have many extras to make your stay the best it can be. carpets have been renewed this year. When booking a £50 deposit is needed to secure, and the balance must be paid 3 weeks before your holiday, we also take a £50 breakages deposit, to be returned in the week after your holiday. Monday to Friday may be avaialble through the season. just ask. 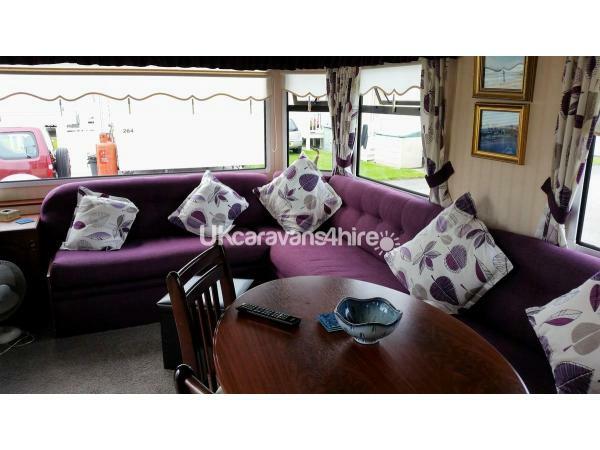 Situated on Owens Caravan Park is our 6 berths 2 bedrooms spacious, very well equipped caravan for hire. 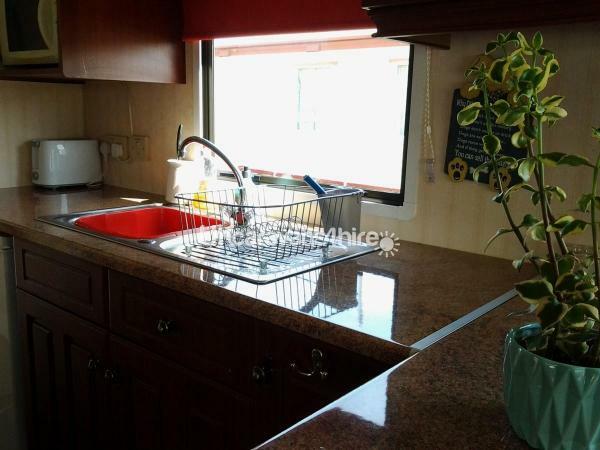 It's a great place for a family holiday or just a peaceful getaway for a couple. without all the noise and bustle of the centre. 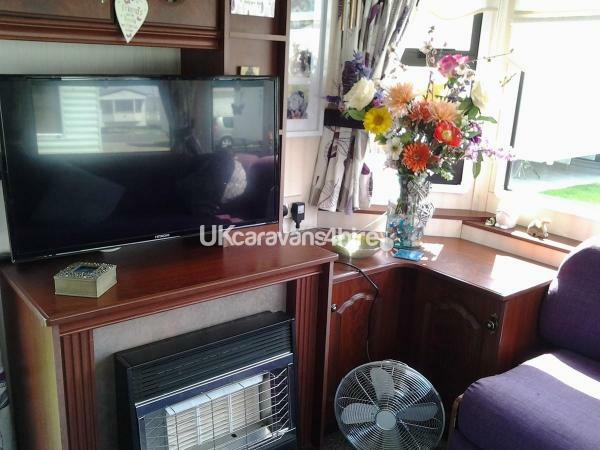 32" smart TV, DVD, free view, Microwave, slow cooker, the fridge has a small freezer inside. 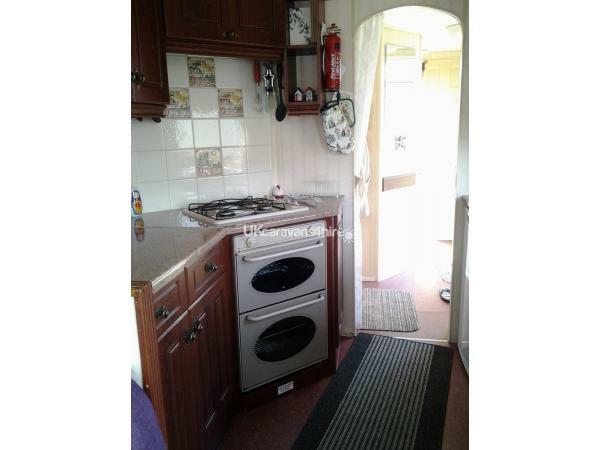 A lovely well-equipped kitchen, plenty of storage. 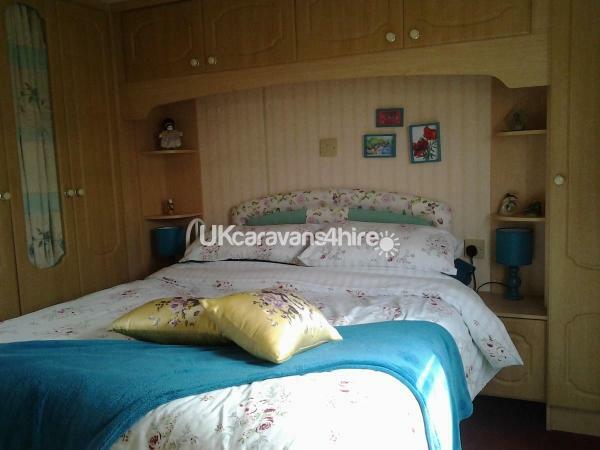 The double bedroom is large, 10ft wide has a full-size Double very comfy bed, fitted wardrobes, also a TV. plenty of room to move around. 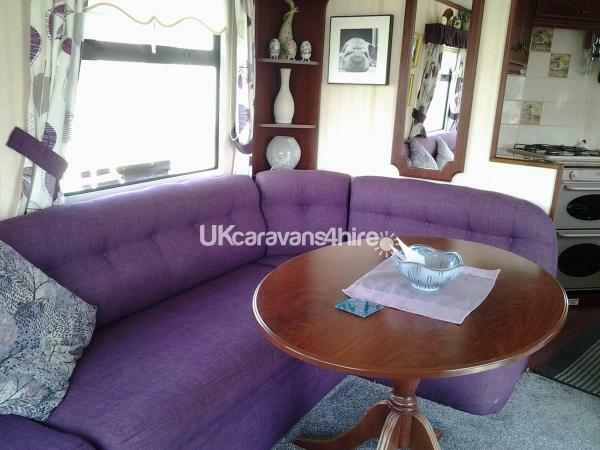 There is a fold out double bed in the lounge. if needed. 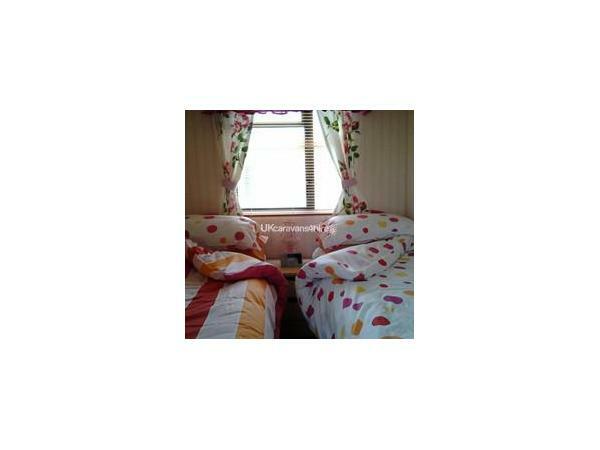 WIFI in the camp is with Silver linings you can log onto there site or go to the office for further details and costs. The lounge as you can see is roomy with seating all around. Large dining table. We have a 28' veranda with a gate at both ends, making it safe for small children. the garden is lovely with a patio area, It's a lovely little sun trap. we have a patio umbrella for your use. parking on the road just outside the caravan, we don't allow parking on the grass as it spoils the grass. We have lovely rattan patio Furniture for your use. we have Monday to Friday breaks throughout the season on request. The camp has a lovely Cafe, (Miss Owen) the food is excellent and service is really nice. very welcoming. The cafe also has an outside seating area with a great new feature for the camp. get your gorgeous Welsh ice cream here. Just outside the Owens Caravan Park are a well stocked Spar shop and post office. The Wendover pup, with seating outside. With food available and a new Restaurant. The very popular chip shop just over the road. We are just a short walk to all the fun Towyn has to offer, Fairgrounds, Amusements, clubs, Bars and Restaurants and weekend Markets and car boots. We have bus stops just outside the camp taking you in both directions, to Rhyl and Prestatyn one side and Llandudno, Colwyn Bay, Conway, and Abegele plus many more places the other side. Have a go on the open top Bus. Try going further afield to experience the wonderful holiday experience that Wales can offer. Betwys y Coed is a most beautiful place to visit and if your a walker make sure you go prepared. But if you just want to see a lovely place with a good selection of places to eat. nice shops, I am sure you won't be disappointed. Rhyl has had a fabulous facelift. The promenade is now lovely. From the Hub in the Harbour, just over the bridge into Rhyl, there is bike hire is available for the great coastal path, with bikes to suit every need. If you're stuck for somewhere to go. just ask we have lots of good places. all just a short bus ride or drive away. Towyn has a Brilliant weekend Market not to miss. Additional Info: Owens is a small quiet very well kept the family site, Try the new Cafe. Launderette. we don't need anything else. .Just outside the camp, there is a chip shop, spar shop, and pub, and minibus pick up to take you to Brown's club. No reviews found. 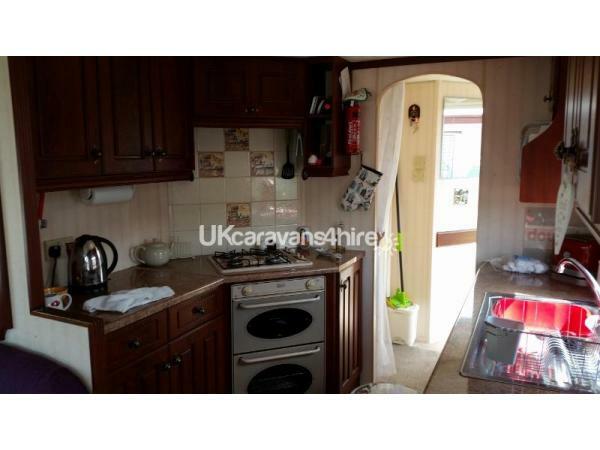 If you have recently stayed in this holiday home please leave a review, it only takes a few moments and will really help future guests when they are searching for holiday accommodation at Owens Caravan Park.